Take Rte. 501 South (Broad Street), approximately 1 mile south of the square in Lititz. Landis Wash and Lube is on the right, past Keller Bros. Ford and Weis Market. Take Rte. 501 North (Lititz Pike) toward Lititz. 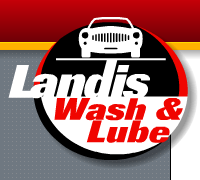 Landis Wash and Lube is approximately 1 1/2 miles north of Lancaster Airport and .7 miles north of Stauffers of Kissel Hill, on the left.